"Practical Negotiating is an innovative, resourceful, and-as its name implies-practical guide to the art and science of negotiating. Unlike many books on negotiating, which are filled with theories and anecdotes, this one is rich with examples, tactics, and tips, which makes it the indispensable book when you are going into any negotiation." "There is something in this book for the most experienced negotiator and the novice. Gosselin's no-nonsense prescriptions and recommendations will hit home and give you new ideas for the most difficult of negotiating situations. Anyone in the business world will want this great bible of?effective negotiating right near their desk and phone!" "Gosselin has written a thoughtful, engaging, and practical guide on a topic of increasing importance to leaders and organizations. There is something here for anyone who wants to learn how to deal more effectively with the inevitable conflicts that occur in working with clients, customers, and colleagues." "Forget the image of negotiation being a battlefield. ?Gosselin guides you in the development of a road map so both sides become winners and leave the table victorious. His writing is just like his training-clear, concise, and practical. You can apply the process immediately. A handbook for life, it's practical, thoughtful, and insightful." "Skip the workshops and buy Practical Negotiating. After field-testing the content through decades of experience, Gosselin has packed this useful book with processes that work and great questions and worksheets that force the material to become real and personal. Practical Negotiating will change your thinking about negotiating, and more importantly, will change your behavior. Highly recommended." "Gosselin is a most articulate and engaging businessman, and this, coupled with a keen intellect and sharp observation of behavior (and a great sense of humor!) make this a must-read. His deep understanding of effective models of negotiation and their practical application make him one of the leaders in this field." 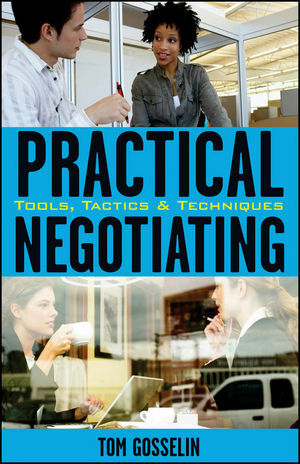 "This book is aptly titled as it provides the practical 'how to' for planning and executing effective negotiations. It's rich with examples, exercises, and reusable tools." Tom Gosselin is a consultant and instructor with more than twenty years of experience training executives, managers, and salespeople. He is a member of the National Speakers Association and his corporate clients include Philips, MCI, and ExxonMobil Research & Engineering, among others. For more information, visit www.practicalnegotiating.com. 1 The Need for Negotiation. Introduction to Planning and Executing the Negotiation. SECTION ONE: PLANNING THE NEGOTIATION. 3 Setting Objectives and Determining Positions. Determining Position and Settlement Range. The Rule of Power in Negotiation. Practical Negotiating: Planning Guide—Part 1. SECTION TWO: EXECUTING THE NEGOTIATION. 6 Negotiation Model: Stages with Critical Tasks. Stages: The Negotiation Process Road Map. 7 Negotiating Styles and Key Skills. The Difference between Negotiation Styles and Skills. Choosing the Best Overall Approach. 9 Adversarial Tactics and Countertactics. How to Determine Your Tactical Orientation. Negotiating in Buy and Sell Situations. 12 Putting It All Together. Appendix A: Negotiation Style Survey. Appendix B: Practical Negotiating: Planning Guide.